I saw Topsy now give us a great few tools in their advanced search ie @xyzNews and from:@xyzNews which allows me to calculate tweets and account references in the last 30 days. 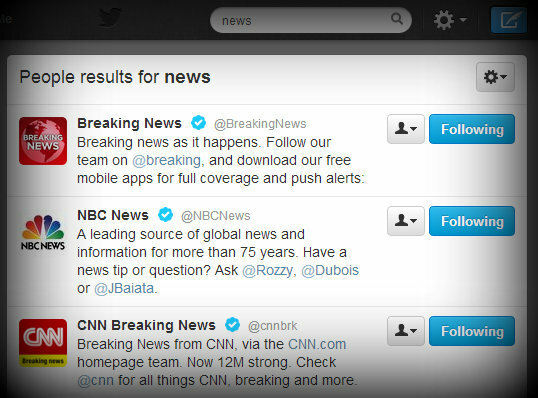 Method I went to twitter, searched for news and noted the first 50 accounts - as a follower of the news myself, I was already following a bunch of sites. I added a few that did not show for interest and fun. A few hours later, I had a google sheet full of data, made a few charts and here we are. As usual, I will highlight some keypoints and let you loose on the rest. I don't claim to know anything just layout a buffet of data and create a conversation. About the data sheet We have 60 News Orgs listing their twitter followers, tweets a day, references a day and three calculation for: followers/daily refs, daily refs/followers and daily refs per tweet. In a day, there seem to be 2,944 tweets made, that's 123 an hour, but for those who sleep - this could be 184 tweets to read based on a 16 hour day (glued to your screen). On followers In total there are 111,574,090 followers for the 60 Orgs. The top two make up for 20% where the bottom 40 accounts also make up 20% - demonstrating the classic long tail/power law ratio (long tail at wiki). How much do they tweet? On average about 48 times a day. The Huffington Post are either super clever or super out of control tweeting 353 times a day. That's one tweet every 4 minutes. 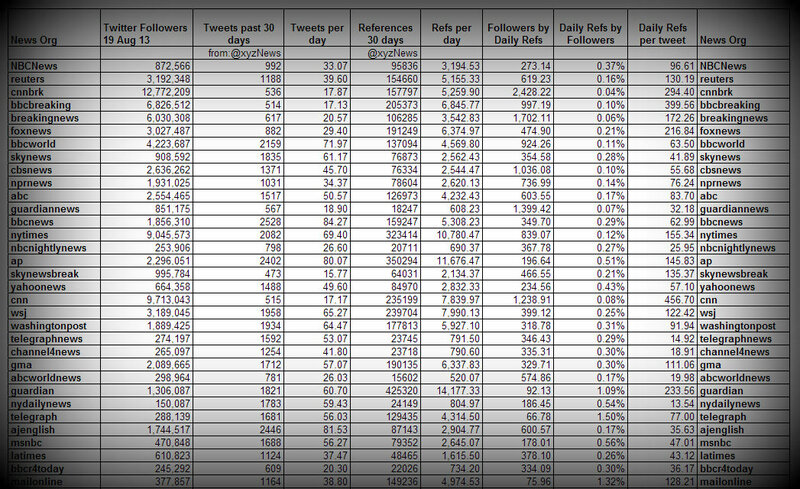 In second place, The UK's Daily Mirror makes 103 tweets a day. there is a massive from 103 to 353. Anyone from the +The Huffington Post reading this, please let me know. I use common sense when looking at this data, so we have accounts with a bunch of followers, tweeting all day long, getting retweets and mentions. I guess the smart money will be on seeing your tweet getting many references. CNN, BBCBreaking and Anderson Cooper seem to fair well at this. Huffingtonpost, +The Guardian, +The Associated Press and the +The New York Times have the most references. 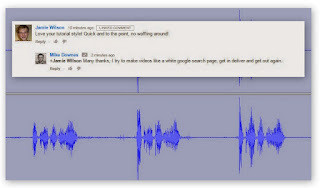 Conclusion I'm doing a whole lot more analysis and when this post goes public, sure a conversation will start. I hope this post may appeal to news types like +Jeff Jarvis, +Richard Gingras and +Clay Shirky. I'm a big Google+ guy - the main question: If we believe the data that there are 200 million active users on Twitter and 390 million on Google+, then something has got to give. For example, if news Orgs used g+ correctly ie posted about breaking news, then I would place them in my google+ alert circle and get notified immediately. It's my wish that meaningful discussions would then break out (yes in more than 140 characters). And yes, this post is niggling me a lot - it's unfinished. One simple more is to look at maybe 60 top journalists, see what their tweets look like. 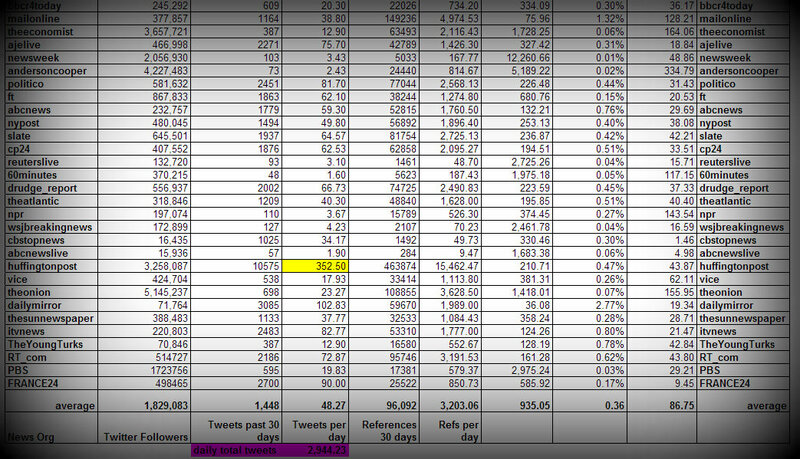 As a sneak, +Jeff Jarvis has tweeted 1,389 times in the last 30 days (46 a day) with 12,869 references (429 a day). Two points, 1, Jeff tweets as much as the average news org 2, His daily refs by followers is also equivalent to a news org.